The concept of Food Vans and Trucks is relatively new in Australia, with them only accounting for for 1.3% of all Fast Food sold this year, however this is expected to grow rapidly as Australian cities catch up with cities like San Francisco and London, and as the menu moves beyond the standard fare of donuts, gelati and low end take away into gourmet offerings. Food vans are popular with customers because they can offer a select range of foods, at a very attractive price and often in great locations that are convenient to them. For restaurant owners, food trucks are popular because don’t pay rent, have lower staff costs, can move location, and allow chefs to experiment with a range of foods. They can be excellent promotion for a full restaurant as well, effectively offering a tasters menu. Some of the advantages of the food van are also some of the weaknesses in the marketing for them. Because they are not tied to a location, finding one can be an issue. There are some apps that will track food trucks in real time allowing their customers to find their favourite food truck when they want to. So, how to market your Food Truck? The first priority is to settle on the concept, branding and logo. You have a mobile sign travelling around the city, so you want to maximise the potential from that. It also helps drive engagement on Facebook. 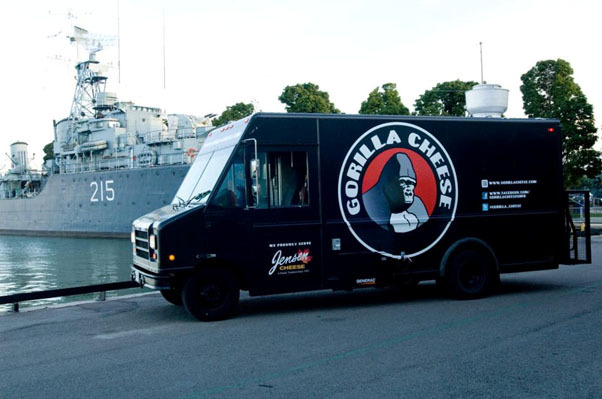 Food truck branding is crucial in building buzz and a following. Standard.co.uk. The marketing for Food Vans is different to a standard restaurant because of the fact that the van is mobile and can be at different locations at different times. Therefore social media marketing is much more important for the immediacy required to get your current and planned locations out there. This is assuming that you are building a brand and not just a food truck that follows the big crowds, which is also one of the options, although there is often more competition. Great food vans develop a following which means less price competition and this is especially true as the menu moves into the ‘fine dining’ or niche products category of food. Facebook is great for building the brand, twitter is great for getting the message about the location out there and Foursquare can help as well. For Facebook, lots of great pictures of the van in great locations, because the great thing about a van is that the location, which is part of the experience changes. This will make people want ‘the experience’. Of course, great pictures of great food are very important. They help sell people on the idea of your food and experience. Great food vans don’t just rely on people walking by, but generate buzz and hype to make the van a food destination for their customers. The website also helps to build the story of your food van. 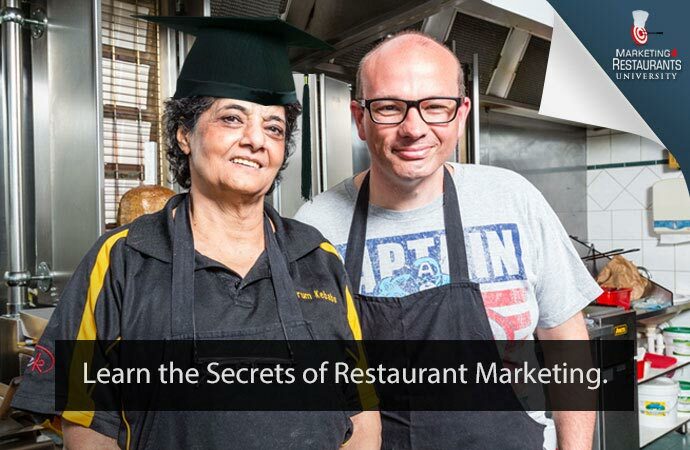 It enables you to go into more depth about your food, the eating experience, the niche markets you cover and the menu. Because you aren’t limited to the amount of text, things like the menu are much more accessible on the website. An easily editable website is critical because you will be changing the addresses frequent as the location changes. Being optimised for mobile is also critical because many of your customers will be on foot and therefore using their phones to find your location. Great SEO also helps because it enables you to differentiate your van from others as well as your other competitors, which will be fast food restaurants, take aways and restaurants in the general area. 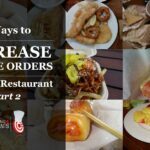 The website is also a great place for your photos, because many people will see your food photos on a big monitor screen in all their glory which will naturally make people hungry. 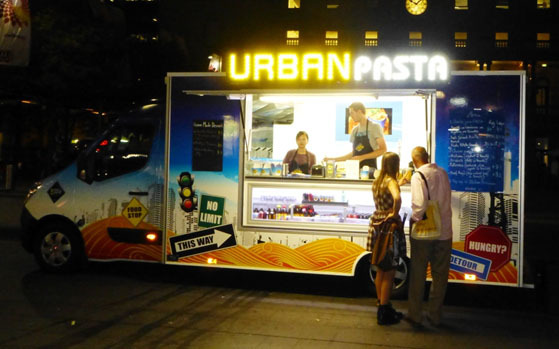 Urban Pasta is one of the popular Sydney food trucks. Hopefully there are a few ideas to help you get you started in marketing your food truck. Time to break up with your online ordering Frenemy?